she would never be mistaken as "granola"
after 7-10 hours you will see thickened milk soaking in the whey. give this a good stir, then spoon into containers and place in the refrigerator for at least 12 hours before eating. what i do next is not necessary, but hubster and i have different ideas about how thick yogurt should be. i like mine extra thick, he doesn't. i place the yogurt in a sieve lined with cheesecloth over a large bowl, and let it sit for a few hours or overnight. 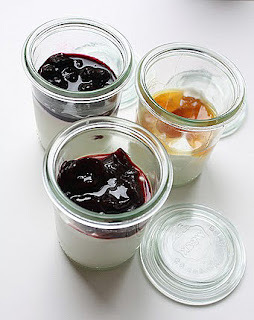 the yogurt becomes the consistency of cream cheese, and the whey collects in the bowl. i place the yogurt in one container and the whey in another. when i make up my pots of yogurt, i whisk in enough whey to achieve the desired consistency. 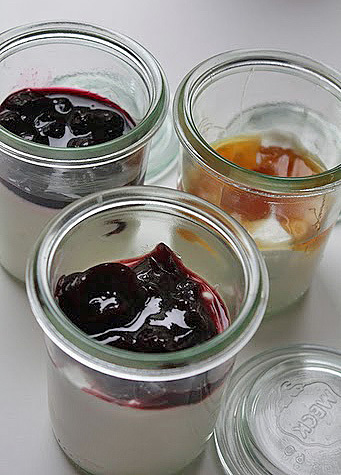 the extra thick yogurt is great as a spread on bread or for flavored dips.